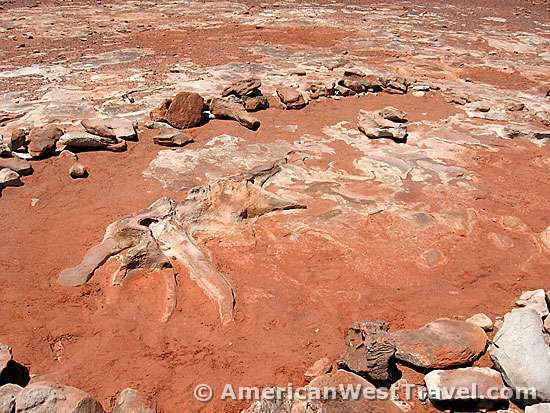 If you are traveling in northern Arizona between the South Rim of the Grand Canyon and Lake Powell, or perhaps driving up to Monument Valley, a convenient and informal roadside stop near Tuba City features dinosaur tracks, an unearthed dinosaur skeleton, and a colorful slice of the Painted Desert. From highway US-89 about mid-way between Flagstaff, Arizona and Lake Powell (about 65 miles either way), take highway US-160 east about five miles. This short stretch of road offers some colorful views of the Painted Desert before climbing a mesa top at Tuba City where the landscape becomes mostly nondescript desert. Look for a handmade plywood sign on the left (north) side of the road announcing dinosaur tracks. A short drive takes you to a parking area with a number of shacks. 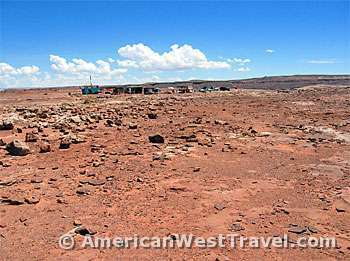 This land is part of the Navajo Nation, and you will probably see a number of natives selling their wares – generally jewelry and other crafts. Locals will likely approach and offer to show you around, pointing out the tracks and the skeleton. As of my last visit, there was no entrance fee but the protocal is to provide a local a small tip for a quick tour. However there is no requirement to tip anybody. We gave one of the locals $10 to show us around. 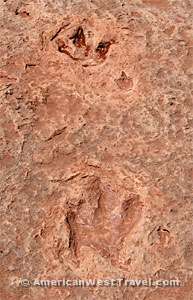 He briefly pointed out the several trackways, consisting of three-toed, clawed footprints generally about six inches to a foot long. He also pointed out the dinosaur skeleton. However the area is flat and open so it would have been quite easy to find everything on our own. The articulated (meaning that it is largely intact, rather than just a pile of bones) dinosaur skeleton is believed to be a dilophysaurus, a meat-eating creature standing about six feet tall at the hip. The tracks in the area probably belonged to this same species. The Painted Desert dates to the Triassic Period (which came before the more well known Jurassic Period) over 200 million years ago. The dinosaurs found here therefore date to the earliest period of their reign. This site is level, the attractions close to the parking area, and you can tour here in a half-hour or less. It is shadeless and very hot in the summer.